A Novell employee and Moonlight developer, Jeffrey Stedfast1, has just posted this mind-boggling rave about Moonlight spreading and getting inside other hosts (distributions). After the TomTom lawsuit we understand very well why this is trouble [1, 2]. 1 Previously mentioned in [1, 2, 3, 4, 5]. Mandriva, Ubuntu, Debian, Gentoo, and FreeBSD… and Suse of course. That pretty much all the majors; and Ubuntu alone probably means 90% of all Linux installations use Moonlight. I think you should give up your attempts to make it look like Moonlight was on the decline, it starts looking ridiculous. Silverlight is going nowhere, but Novell sure promotes it in exchange for those hundreds of millions Microsoft pays Novell to do this. There was a rumour that, in the wake of the TomTom case, Canonical was seriously considering removing Mono from main and leaving it to multiverse as too dangerous to support (like mp3). I haven’t been able to find any more info either way, asking around. You are missing the point. The argument is not about deprecating something because it’s not popular. It’s about deprecating something because it is *dangerous*. It’s about deprecating something because *their gain is our loss*. Novell are in a compromised position because they agreed to take the anti-FOSS side of the bet. Being anti-FOSS may be popular in some demographic circles, but it’s a damn lousy way to justify what FOSS behavior *should* be. Software freedom and open source mean *nothing* when the code gets polluted or diluted or merely convoluted with hostile patent claims. I’d hardly call your threads “evidence”. While I will agree that there is potential it still remains to seen how the patent suit resolves itself. If it all goes in MS’ favor then we can call it evidence and you’ll be able to say “I told you so”. If the suit fails, which I hope it does, your “evidence” becomes more suspect. As the major distros are free to include mono – the end user is also free to remove it or use another distro that doesn’t have it in it. Even if MS tries to exert control over Suse – who cares? That control can not extend to the other distros. If Novell/MS increase cost or make the Suse distro too restrictive – anyone using it can switch to a “non controlled” one. At the end of the day there MS either has a case or it doesn’t – the only way to find out is to force a case and make MS justify their claims. Instead of sounding the Novell death knell again – how about gathering support (moral and financial) for Tom Tom? I fail to see how a patent claim can pollute or dilute code. @JohnD – do you understand Canonical’s rationale for not allowing MP3 codecs into Ubuntu main? If so, the threat model may become clearer. Distributions share code, thus dependency gets inherited (e.g. dependence on Microsoft). Even Microsoft influence in the Linux Foundation (LF) rears its ugly head again with a coming public debate. I wrote quite a lot about how Novell in the LF is trouble [1, 2, 3, 4, 5]. Microsoft uses Novell as its ticket. But the sharing of code is by choice – not by edict as evidenced by the number of distros that are choosing not to include mono. Referring to posts that you wrote isn’t proof – you need outside sources and not just the pieces you decided to include in your post. Actually based upon some of what I read the Linux Foundation is no better than Novell – according to one of your posts they are keeping quiet on issues because they are being backed by Novell. Yet you seem to want to save the Foundation. If you don’t like what they are doing start a new one. People didn’t like what was allowed to happen via GPL2 so they wrote GPL3 (I will note that I don’t see droves of people rushing to distribute under 3). That’s choice. The biggest downside of giving out all the code and letting people use it as they wish is this – they will probably find a way to use it that you don’t like. The inventor of the Gatling gun didn’t set out to make a kickass gun – his goal was to make the carnage so horrible that people wouldn’t engage in war anymore. We all know that people didn’t come around to his point of view. As a developer if I decide to write a program that uses licensed codecs or other IP then I should be able to it – the only requirement on me should be to let everyone who might use it know what I’ve done. This way they can avoid using my software if they are concerned with infringement. I have 2 questions for today. 1. Has anyone approached their contacts in Novell and asked them to create free versions of the codecs? Novell would be in the perfect position to create such codecs. They could verify that there are no code similarities and that the methods used are different enough to avoid patent issues (I believe that in cases of hardware a there has to be at least a 10% difference in a design to avoid patent infringement). Don’t ask me how they decide a chip is x% different than another because I don’t know. 2. Has anyone broached the downstream/inheritance issues with Novell? Specifically – a method to identify Novell submitted code so that it can be removed or omitted? Or even an addendum to GPL2 that would place financial responsibility for IP infringement on the person/company that submitted code that is proven to infringe a patent? It seems to me that PUBLICLY calling Novell out on these two questions/issues would go a long way towards proving/disproving their credibility with respect to FOSS. If they truly support the community they will publicly engage MS and the community in an effort to build free codecs as well as adhering to policies designed to prevent inadvertent use of protected code. You appear to be expounding aggressively and at length on matters you’ve just admitted you don’t actually understand. @Hemfburger: Thanks. We love hit-and-run remarks from SUSE people. If I find one, I’ll include it in a follow up post. But as I’ve remarked of Roy – you only picked one small piece of my post – I stated that the 10% was my belief – not a fact, nor did I refer to another post I made in an effort to “prove” my “10%” fact. It has stuck in my head for many years ago from an article on AMD reverse engineering the Intel chips and the article stated that the AMD chip had to be at least 10% different from the Intel chip to avoid being sued for patent infringement. See the relation to this thread? I may have actually read it in print, instead of online so I might not be able to find an online reference to it. “Paranoid nutjobs…” or I could try to view both sides of the situation – which is what I’ve been trying to do. I have learned quite a bit from the posts on this site and by reading posts that have been cited here. Only a fool would assume that he/she had a complete and perfectly clear understanding of the whole situation – the legal questions alone prevent that. I would also point out that I have refrained from personal attacks in my posts – which can not be said of others. Even though I may not currently agree with your point of view, I respect it. Which is why I’m trying to learn more about it. For the record I don’t think the MS/Novell deal will work out well in the end, but I also don’t think it’s a good reason to torpedo the company as a whole. I’m still irked at their decision to abandon Netware, but in taking time to read and ask questions I have learned more about why the decision was made. It doesn’t make me happy, but I now see that there are some advantages to their plans for Netware. I also believe that it’s possible to have some good come out of the situation with Linux and MS.
JohnD, I see you representing the group (more than just Novell to some degree) that is the advocate of The Fox and is trying hard to get the hen establishment to award The Fox with full hen privileges and accesses, to treat and behave around The Fox just as if The Fox were actually a hen. Naturalize The Fox. Then when we see cases of The Fox eating up a chicken or two, you want us to be patient and see if The Fox will in fact finish up its meal or will abort midway or if the chicken will manage to fight it’s way out and survive. Have patience with The Fox, you say. The problem is that Microsoft is not special and worthy of the umpteenth new opportunity and resetting of the slate. No amount of Novell helping them to embrace and extend FOSS is going to change minds like mine. Microsoft is not an ordinary proprietary vendor nor ordinary creator/dealer in software patents. Frankly, I see no way to reconcile Monopolysoft’s existing position and track record with a future embrace that would be beneficial to Linux+FOSS. The longer Novell remains on this path, the more Novell’s ranks will attract people that would very easily work with and adopt Microsoft’s many approaches without a blink. By then (and maybe this is where we are today), there will be few tears shed with any negative consequence that may befall Novell. @JohnD – yes, you have every right to voice your opinion, and everyone else has every right to point out when you have literally admitted you don’t know what you’re talking about. Mark Shuttleworth was speaking to Microsoft about codecs. So far the codec talk has gone nowhere. And VLC, ffmpeg and mplayer are in Universe. I am not an advocate of the Fox by any means. What I haven’t seen yet is the “smoking gun”. I prefer to deal with facts, not suppositions. I agree that dealings with MS should be regarded with suspicion, but would not agree that the community should run around with it’s hair on fire chasing every little shadow because Ballmer might be hiding in it. It’s a waste of time and energy. Every distro needs work to be able to truly start winning converts from the masses – that’s where I think the community’s focus should be – not tearing each other apart. The MS saga will not be resolved in the near term in my opinion – they will drag it out for as long as they can FUD works best over the long term – just any old CNE. That’s why I think in the near term the focus should be on improving the product – which benefits from the advances made by every distro. I believe that software patents are wrong, but for the time being they are the law of the land – so let’s figure out progress by using OIN etc. Where I run into problems as a business person is – my clients need things that are simple to use and are compatible with systems they have in place. I also need market clout in order to fight MS FUD along with an established support structure. I have managed to move Linux into two of my clients an it’s had its challenges – ones I’d prefer not to have (mostly with backup solutions). So while I embrace many of the FOSS ideas I’m restricted by business realities. The only thing I admitted to was not knowing everything. As a wise person once said: “I’m no longer young enough to know everything”. Perhaps you could point me to the posts you read (preferably outside of this site) in order to form your understanding of Canonical’s rationale. When I have a chance I’ll read them and we can compare notes. I know things exist in the universe, but will they let me drop in any DVD and play it? My client wants a new laptop and to save money. If I hand him a notebook with a default Linux distro installed can he put in a DVD and have it play without jumping through hoops? Will he be able to see all of the other machines on his network and be able to browse their shares? Again, without jumping through hoops. I take the time to work these things out on my laptop, but my client won’t – he’ll just get pissed at me. These are the issues that matter to my clients and by extension to me. I will admit the first time I heard Novell claim that their customers requested that Suse and Windows work together I was skeptical – but now that RedHat has done an about face (sans money) I’m revising my stance – maybe Novell customers did request it. JohnD, when a proprietary vendor competes with Linux+FOSS, we say, “hey, there’s a proprietary vendor competing, let’s see if we can outdo them,” or we might even just ignore them, or there is even some chance we may like them, depending on the situation (here “we” is the more pure side of the community.. the people that genuinely thrive developing FOSS and routing for it). JohnD, you describe a sad story that unfortunately affects many people. What I might recommend to you to pass along to customers is for them to continue using and maintaining their existing investments, but invest in platforms like Qt, Java, and web applications that don’t use any dependencies on Monopolyware. There is currently sufficient support to allow a fair amount of interoperability and to help migration costs. The key is to stop adding new Monopolyware unless the customers want to continue singing the same sad song into the future. No company besides Microsoft could offer fair support for Microsoft technology. How many compromises does the customer want? If they want to stay with MSware, there is a price that comes with that because that is closed source. If I were presenting an open solution to a customer, I would not look at “dotnet”. If the customer could not accept that, we would probably each save ourselves some headaches by cutting back our relationship. I’m not a physician, nor a lawyer.. I’m not a Monopolysoft technician or “solution” provider, either. Like I said, there are ways to deal with existing Monopolysoft investments in a way that is fairly independent of Monopolysoft. I am not an advocate of the Fox by any means. What I haven’t seen yet is the “smoking gun”. Are you volunteering to take the first bullet? If not, I reject the notion that we should not prepare ourselves for the consequence that when the gun is smoking, somebody, somewhere, is bleeding to death on the streets. JohnD, your view, I believe, is that Novell sits Microsoft and the others down at a table and tries to be an intermediary. There are many problems. Intermediaries are not needed. Microsoft can come directly to the people and present their case. Do you understand the threat that Linux+FOSS presents to Microsoft’s current business? Do you understand the weapon Microsoft currently wields because of their market status, closed source software, and various other levers? 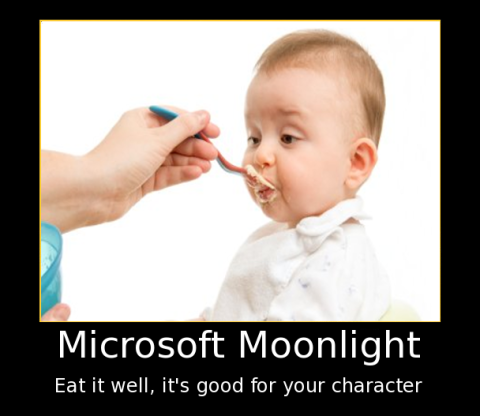 At some point, Monopolysoft will be neutered, I hope, but that day was not a few years ago, it isn’t today, and I will wait until it’s clearly happened before considering doing business with that company (Microsoft or anyone working on their behalf). Novell is fine with us meeting Microsoft “halfway”. That’s how they make their money. Open source benefits customers. Meeting Monopolysoft “halfway” is actually short-changing ourselves and the customers/users everywhere. There is no need for this. Linux’ value will be more clear to more people as time goes by.. if we continue working to better Linux and according to our principles and defensively. We can’t contribute, criticize, leverage any MSware. When we say “Linux” we are talking about something that is accessible to everyone. Many users of all types contribute to it. It’s hard to argue against that. It’s also hard to argue that there can be any “halfway” that preserves the *monopolies and various levers* of Monopolysoft. Novell accepts Monopolysoft and their levers. What does that say about their ability to be an open source (Linux) service provider? Is Novell working for the customer or for Microsoft? I don’t want Novell to act as a middle man – far from it. I think Novell has stepped in front of the gun so they get to take the bullet. For the record: I will be 40 in May, my first computer was a Vic20 and I taught myself line numbered BASIC and assembly with peeks and pokes. So I’ve been around a while and I’ve seen first had what MS has done to the industry. I don’t support them or their ways of doing business. When the DOJ was thinking about breaking them in half – I was screaming YES! I’ve also seen them sneak out from under the Karma bus time and again. What I want people to think about is that there is a segment of consumers that want what Novell is selling. That these consumers are more concerned with their business than with the FOSS community’s ideology. I see the Tomtom suit as proof of Microshaft being Microshaft and not much more. I also see it as an opportunity for the FOSS community to band together to fight M$. I think the IT industry as a whole needs this suit to be resolved one way or the other. I also think it will be a win for FOSS either way. If MS loses, FOSS will have some measure of vindication, if they win I think it will polarize the it industry as a whole. This suit needs to be front page stuff and the ramifications made clear. FOSS needs to take advantage of the Vista debacle asap. That means getting on to as many desktops as possible. Linux won’t get market share until they get mind share and for that to happen – people need to see Linux in action. Am I the only one who notices that Winblows 7 seems to be adopting Linux methodology? Modularity, speed improvements, ability to run on less than top end hardware….I think MS is using the suit to try to slow down Linux until 7 is ready. Yet another reason to try to increase Linux adoption asap. While patent reform is needed, there is no way the big boys will allow legislation to pass that immediately invalidates all software patents. Most likely they will stop issuing new software patents and old ones will be allowed to expire. Remember MS isn’t the only one who benefits from patents IBM, HP, etc all apply for patents so they have a vested interest in the system staying the way it is. Linux can’t wait around and hope that everything rolls it’s way. I have no desire to see MS undermine Linux or FOSS, but life has taught me that sometimes there is more than 1 path to success. It’s also taught me that some times you have to compromise to achieve your goals. It would be nice to take the high ground and avoid any client that wants to use MS instead of FOSS, but I have bills to pay and I don’t see only supporting FOSS as a way to put food on my family’s table. For example one of my clients is an accounting firm they aren’t wild about Quickbooks, but it’s the dominate package in use by their clients so that’s what they use. They are also getting files in docx format – since it’s not out for OO or Symphony I can’t offer that as an option yet. I informed them of the issue, but they don’t want to dictate to their clients how to save files. So we’re stuck. I mentioned using OO to another client and they want to use what their government clients use – MS Office. I mentioned that OO is free, and I was told that the military gave her a free copy of MS Office 2007 – apparently MS provided a Military Appreciation version for free. I’ve managed to get Linux into 3 clients in the server room, the desktop is off limits at this time. This is why I support more of a compromise stance as opposed to the “our way or nothing” stance. On the support front.. The gov might move more into FOSS and solve some of your problems on your behalf (to make up perhaps for having helped create it in the first place). I’m not against people choosing what they want to use. I’m saying I would not support the business setting you described, and I do think Linux will have greater chance of uptake down the line, the better it gets, not the closer it gets to Microsoft (that would be a subversive distraction). If you feel a need to support MSware for your livelihood, go ahead. You can still keep up with Linux and even contribute. The interop failure is controlled by Microsoft by design (we show *all* our code). That has been a strategic part or their business for ages. For numerous reasons I don’t do business with Microsoft. If you felt attacked here, understand that some people feel attacked by the content of this website and have themselves helped make the atmosphere here less than sunny at times. Such is the nature of the beast. You won’t catch anyone here throwing rocks at anyone else without having an “I’m only defending myself” excuse. Jobs and more are at stake for lots of people. Hopefully, your skin is thick enough to manage the rougher moments. Finally, Linux customizability and openness offers tremendous business opportunities if only as a marketing tool you can help design for your clients or for yourself. It pays in many ways to steer clear of Monopolysoft lock-in traps. The sooner the better, but it’s never too late to seize control and help your customers seize control themselves. Hey, it’s free to sample and trial! It’s free forever. And you don’t need to pay or get permission to modify to suit your needs nor to share or sell it. That army of support people you see on Verizon commercials is much how the Linux community works. Different people play different roles at different times, and we have been known to fight with each other, but we’re all in this for mutual benefit. The “stuff” is all one great big batch of stuff we all effectively own. It’s sleep time for me.